Hillary Clinton donated the maximum allowed contribution to more than a dozen Democratic House candidates in 2018 midterm last month as her party battles to regain control of at least one chamber of Congress, according to new filing records. Clinton made the contributions through her Onward Together organization in June, donating the maximum of $5,000 to 19 Democratic House candidates and four secretary of state candidates, according to finance filings with the Federal Election Commission (FEC). Many of the House candidates, at least 11, are running in Republican-held districts where Clinton won in the 2016 presidential election, according to CNN, which first reported on the filings. 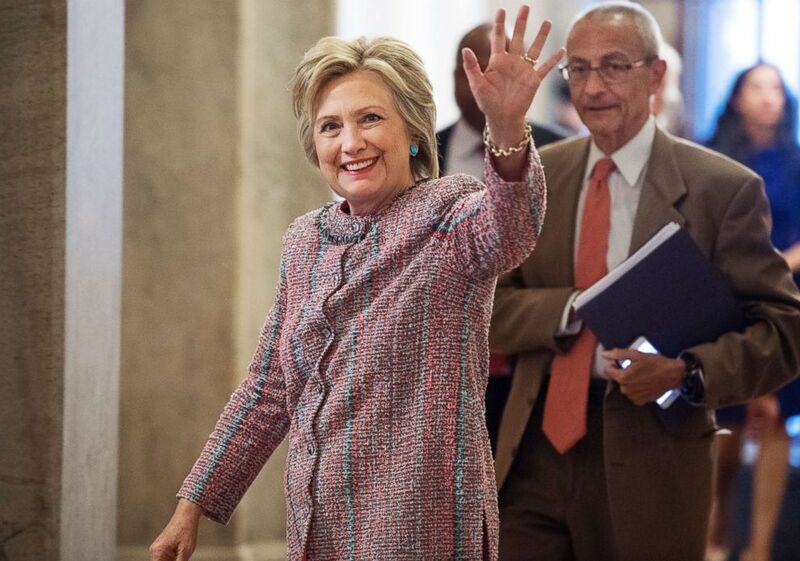 Presidential candidate Hillary Clinton and her campaign chairman, John Podesta, arrive in the Capitol to meet with Senate Democrats, July 14, 2016. The House candidates who received the max donation from Clinton are located in districts in California (6), Pennsylvania (3), Illinois (2), and one each in Ohio, Texas, Nevada, Virginia, Colorado, New Mexico, Georgia and West Virginia, according to the FEC filings. Clinton also donated the maximum allowed to four secretary of state candidates: Nelson Araujo of Nevada, Deidre DeJear of Iowa, Jocelyn Benson of Michigan and Kathleen Clyde of Ohio, according to the filings. The former presidential nominee has mostly stayed away from the campaign trail this year, although she did say she was proud of the record number of female and minority candidates running for office. Democrats would need to win at least 24 seats to gain a majority in the House, where at least 41 Republicans are planning to retire, resign or run for another office, according to an analysis by ABC News. Control of one chamber on Capitol Hill would give Democrats the power to block the Republican agenda and use their majority power in the respective congressional oversight committee to launch investigations into the White House.